Little Tokyo UnBlogged: Next Generation Remix 2009! Next Generation Remix 2009 is coming soon! Its going to be Saturday August 22nd from 6-10 PM in the JACCC plaza. Best of all its FREEE! So be sure to come stop by and bring all your friends, their will be live performances and much more. 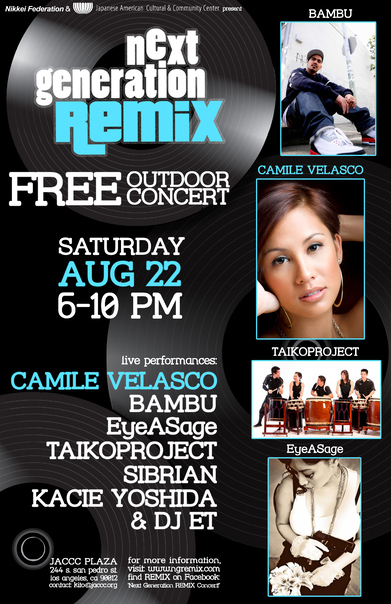 Performers include Camile Velasco,Kacie Yoshida aka Diane Dylan, EyeASage, Taiko Project, Bambu, Sibrian and DJ ET. Incase you have never been to Remix before, its a concert which is put on by one the Nikkei Community Interns, every year it features different performers but always is a lot of fun. Remix is intended to be not only for the youth, but for people of all ages to come out and enjoy. To my knowledge remix is in its sixth or seventh year running, and there is a lot of cool new stuff planned for this year.